HWg-WLD detects water leaks or water floods along the entire length of the sensing cable. The sensing cable detects even the smallest volume of water, ethylene glycol, or other conductive liquid. HWg-WLD can be ordered in two versions depending on the supply of power (power adapter or PoE IEEE 802.3af). The sensing cable detects as little as a few drops of the liquid, and can be used to detect condensation. After flooding, the cable can be dried and reused. HWg-WLD features a built-in web server and SNMP support. 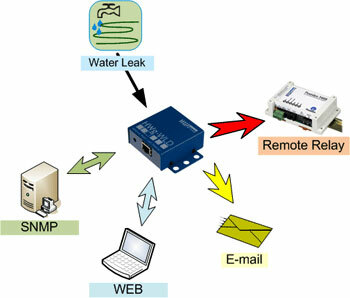 In case of an alarm, the device sends an e-mail or SNMP trap. Alarms can be also signaled by switching a remote relay over the Ethernet. When a leak is detected, HWg-WLD activates a relay of a remote Poseidon or Damocles unit (Box-2-Box mode).